So last weekend I had the chance to go to NYC for a few days. And it. was. great. Obviously I went to several bakeries. I hit Billy's Bakery, Baked by Melissa, Crumbs, Sprinkles, Laduree, and another Crumbs. 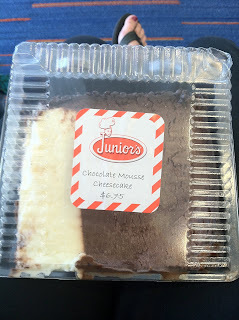 I also got cheesecake at Juniors. Plus all kinds of other yummy foods- including a wonderful dinner in Little Italy. Of course, no trip to NYC would be complete without a little Anderson Cooper stalking searching. I tried to figure out in what part of Manhattan he hangs out, but no luck. I really love that he lives away from the spotlight for the most part, but a few helpful hints would have been nice!! Unfortunately, my quest to see Anderson was far less successful than my search for treats in the city that never sleeps. Let's not talk about the nutrition info involved here, k? Great. This time I decided to go with just a cheesecake, rather than a cheesecake/other desert combo. I couldn't decide between pumpkin cheesecake (which was so perfect for a cool, fall night) and chocolate swirl. Eventually my love of chocolate won out so the chocolate swirl it was! As much as I enjoyed this cheesecake, if I had to do it over again I would probably get the pumpkin. I have become a big fan of pumpkin food in the past few years so I think the combination of pumpkin and cheesecake would be heavenly.